• Eat and Play Discount Card offers additional savings on food, attractions & more! New York City is a destination brimming with culture, history and dozens of iconic sights and attractions! You can experience it all – conveniently and affordably – with our All Around Town Tour! Unlimited hop-on, hop-off access in Manhattan and Brooklyn means you can hop-off the bus to explore iconic attractions at any of our 40+ stops and then hop back on the next bus when you’re ready! The Empire State Building. The Statue of Liberty. Rockefeller Center. The Brooklyn Bridge. These are just a few of the famous sights you’ll see from high above the bustling streets as your professional tour guide leads you through New York’s unique neighborhoods, sharing tales of their fascinating histories. Our 4 curated tour loops run through must-see neighborhoods like Times Square, Chinatown, SoHo, Harlem, and DUMBO. Every All Around Town Tour pass also includes a Ferry Tour of the New York waterways and a Night Tour, so you’ll see the majestic city from every angle! To enhance your visit, this pass also includes free admission to one top attraction of your choice! You can pick from the following list of attractions and make your final decision when you redeem your voucher at our visitor center in New York. To get the full New York City experience at an unbeatable price, book your All Around Town Tour today! Tour lengths vary based on the route and range between 90 minutes and 3 hours. Please see the “Details” tab above for specific route information. Locations vary by tour. Please refer to each tour description under the “Details” tab above for specific locations. Times vary by tour loop. Please refer to each tour description under “Detail” tab above for specific times. Generally, buses run continuously every 25-30 minutes. After you complete your online purchase, you will be redirected to a page with your live ticket. This ticket includes admission for both the All Around Town Tour and your choice of one included attraction. Additionally, an order confirmation with a link to this ticket will be emailed to you within two hours. Simply print or take a picture of the QR code on the ticket and you’re ready to either board the bus at any designated stop or gain entry to your selected attraction. Your ticket is activated the first time it is scanned. How long do I have to visit the included attractions? Your live ticket is activated the first time it is scanned for entry at an attraction or on the bus, and will expire 14 days later. You have one year from the date of purchase to begin using your ticket. How long is my Bus Tour valid? The included All Around Town bus ticket is valid for 48 or 72 consecutive hours from the first time it is scanned on the bus. This consecutive time-frame includes all bus loops, the Night Tour, CitySightseeing Hop-on, Hop-off Ferry and the bonus museum admission choice included as part of the All Around Town Tour. Can I use my live ticket to board the bus? How many attractions do I get? Your package comes with 1 attraction add-on. Do I need to decide now which attraction to visit? No need to decide in advance! Just present your pass at the ticket window of any included attraction for admission. 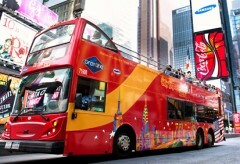 Get the flexibility of a 2 or 3 day hop-on, hop off bus tour through all of New York's most popular neighborhoods! 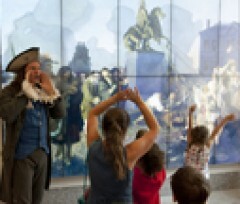 Gain admission to one of NYC's top attractions – choose from our expansive list! Includes a bonus Night Tour and Sightseeing Ferry Tour for additional value and savings! Fully narrated tours available in 11 different languages!